The Vatican’s Secret Archives Library holds one of the oldest copies of the Bible: The Codex Vaticanus. For the Holy See, State of the Vatican City and home of the Bishop of Rome, the Vaticanus is the inspired and transmitted Word of God, the most precious of all the manuscripts in the world and the source of other translations of the Bible. Together with Saint Peter’s remains, the Vaticanus represents infallible proof that the Kingdom of Heaven resides with the Bishop of Rome and the Holy See; no-one can go to Heaven without their blessing. 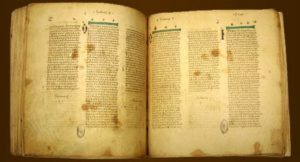 Despite the Vatican’s claim that the mid-fourth century Codex Vaticanus is the oldest full transcript of the New Testament, the real contender for the title is the early-fourth century, Codex Sinaiticus. Third in line and dating around the fifth century is the Codex Alexandrinus. A fourth codex rumored to have been found in Turkey recently, which may also date from the fifth century, refutes Jesus’ crucifixion and denies His Sonship of God, but grants Him the status of prophet, while Saint Paul is considered an imposter. No wonder the Vatican is keen to gain access to this codex! Although it originates earlier, the Vaticanus has only been with the Vatican since the fifteenth century. With at least three revisions to the text since its discovery, it is impossible to say which part of the codex is untouched. It is also unclear where the Vaticanus originates. Some think Asia Minor, others Egypt, and even Rome has been suggested. Using codices like the Sinaiticus, the Alexandrinus, and the Latin Vulgate, folios at the beginning and the end have been substituted. Despite the Vaticanus in parts being a copy of other texts, none of the texts mentioned, neither the Vaticanus, Sinaiticus, Alexandrinus, nor Vulgate, date from the time of Jesus or his Apostles. Nobody knows who wrote the Gospels. The earliest snippets of Gospel text date from around 200 CE. From the contents, scholars estimate the primary authorship to date around 65 and 125 CE, making it virtually impossible for the Apostles to have written them. Paul’s Epistles were written before the Gospels and Acts. Original Epistles could have been authored as early as 45 to 60 CE. Of the thirteen letters and the latter part of Acts dedicated to Paul, six could be ascribed to him. The rest are so different, they could not have come from the same city, let alone the pen of one man. In conclusion, it would appear the Codex Vaticanus is not authentic, but is a copy of other copies and/or texts no longer in existence. The extent to which it differs from original scripts is significant, considering its status. But since original documents do not exist, the authors are unknown, and other texts found over time contradict the privileged rendering of the Holy Roman Catholic Church, the Vatican, who asserts the Vaticanus’ status as the Word of the One, True God, is up for scrutiny.